Damage from powdery mildew attack results in stunted growth. The foliage becomes distorted and twig growth is reduced. Also, the fruit surface may become russetted or discolored, and dwarfed. Heavily mildewed trees are weakened, and are more susceptible to other pests and winter injury. Figure 1. 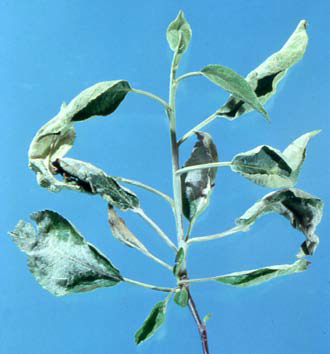 Malformation of apple leaves caused by powdery mildew. Powdery mildew may be found on buds, blossoms, leaves, twigs, and fruit. Symptoms first appear in the spring on the lower surface of leaves, usually at the ends of branches. Small, whitish felt-like patches of fungal growth appear and quickly cover the entire leaf. Diseased leaves become narrow, crinkled, stunted and brittle. By mid-summer, tiny, black round specks show up on the lower leaf surface, but more commonly on the twigs. These are fungal fruiting bodies, but their importance in the disease cycle is probably minimal. The fungus spreads rapidly to twigs, which stop growing and become stunted. In some cases the twigs may be killed back. Leaves and blossoms from infected buds will be diseased when they open the next spring. Infected blossoms shrivel and produce no fruit. Fruit symptoms are not usually seen unless the disease has built up to high levels on susceptible cultivars. 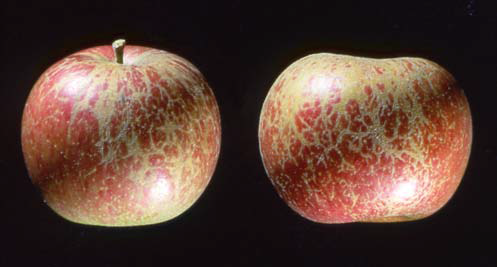 Diseased fruit has a fine network type surface blemish called russetting. Powdery mildew is caused by the fungus Podosphaera leucotricha. Powdery mildew overwinters as fungal strands (mycelium) in vegetative or fruit buds which were infected the previous season. Infected terminals may have a silvery gray color, stunted growth, and a misshapen appearance and are more susceptible to winter kill than are noninfected terminals. Temperatures near -18 degrees F kill a majority of mildewed buds and the fungus within them. Even at lower temperatures, however, some powdery mildew survives. As buds break dormancy, the powdery mildew fungus resumes growth and colonizes developing shoots causing primary infections. The powdery white appearance on infected shoots consists of many thousands of spores which are responsible for spreading the fungus and causing secondary infections later in the growing season. Secondary infections are important because they produce the overwintering infected buds. Secondary infections usually develop on leaves and buds before they harden off and may reduce the vigor of the tree. Fruitlets may become infected shortly after bloom, resulting in a web-like russetting on the mature fruit. Powdery mildew infections occur when the relative humidity is greater than 90 percent and the temperature is between 50 to 77 degrees F. The optimum temperature range for the fungus is 66 to 72 degrees F. Although high relative humidity is required for infection, the spores will not germinate if immersed in water. Leaf wetting is, therefore, not conducive to powdery mildew development. This is quite different from most other foliar and fruit diseases caused by fungi that require free water for their spores to germinate and infect. Under optimum conditions, powdery mildew can be obvious to the naked eye 48 hours after infection. About five days after infection, a new crop of spores is produced. Non-germinated powdery mildew spores can tolerate hot dry conditions and may persist until favorable conditions for germination occur. It is important to remember that powdery mildew can be a problem in drier growing seasons when other diseases are not a problem. Figure 2. Netting pattern on apple fruit caused by powdery mildew infection. Apple varieties vary greatly in their susceptibility to powdery mildew. Jonathan, Granny Smith, Mutsu (Crispin), Rome, Cortland, Baldwin, Monroe and Idared are very susceptible and should be avoided if powdery mildew is a problem. Most other varieties may also be infected if inoculum is present and conditions are favorable for infection. Plant trees in sunny locations with good air drainage. This reduces the humidity around trees and reduces the chances of disease. Where powdery mildew is a problem, a good fungicide spray program is generally required for control. This is especially true in commercial plantings. For the most current fungicide recommendations and spray schedules, backyard growers are referred to Bulletin 780, Controlling Diseases and Insects in Home Fruit Plantings, and commercial growers are referred to Bulletin 506, Midwest Fruit Pest Management Guide. These publications can be obtained from your county Extension office or the CFAES Publications online bookstore at estore.osu-extension.org. Figure 3. 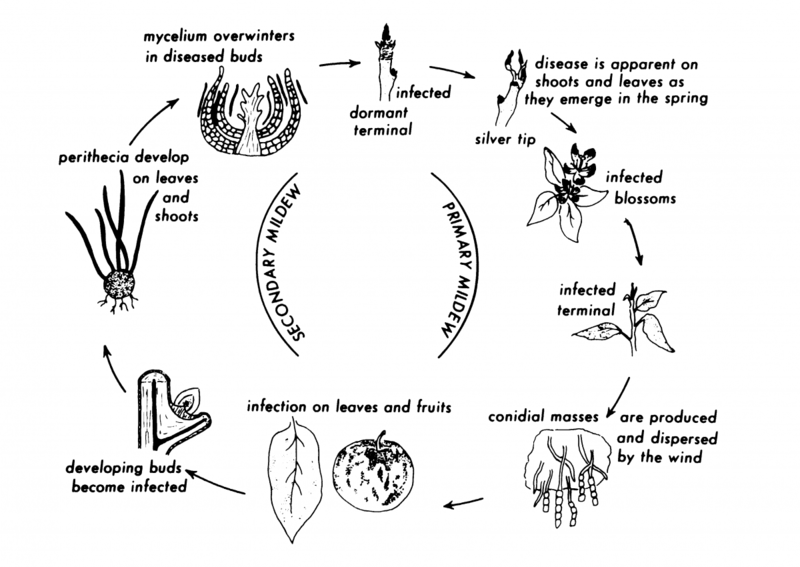 Disease cycle of apple powdery mildew. We want to thank the New York State Agricultural Experiment Station for use of this figure. Taken from Tree Fruit IPM Disease Identification Sheet No. 4.